The familiar, delicious combo of ham and tangy MIRACLE WHIP Dressing you already love warms up your morning in this creamy potato frittata. Combine potatoes, ham and onions; spoon into 9-inch pie plate sprayed with cooking spray. Beat eggs and milk in small bowl with whisk until well blended. Stir in dressing, salt and pepper; pour over potato mixture. Bake 25 to 30 min. or until center is set. Let stand 10 min. before cutting to serve. 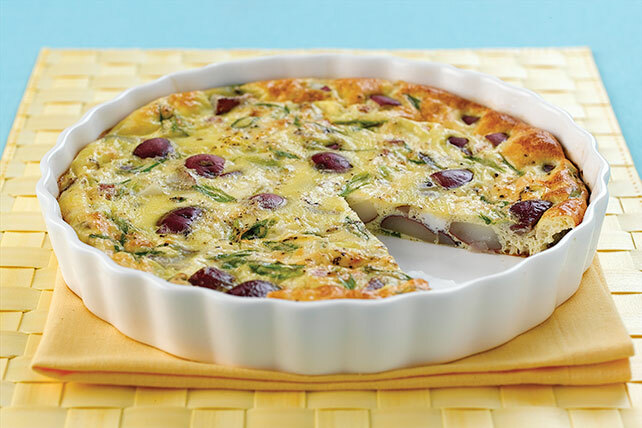 A frittata is a great way to use those leftover vegetables, meat and cheeses in your refrigerator. Be creative and don't be afraid to try something new! Prepare using whatever OSCAR MAYER Ham you have, using half of a 6-oz. pkg. or enough slices to make 1/2 cup chopped meat.